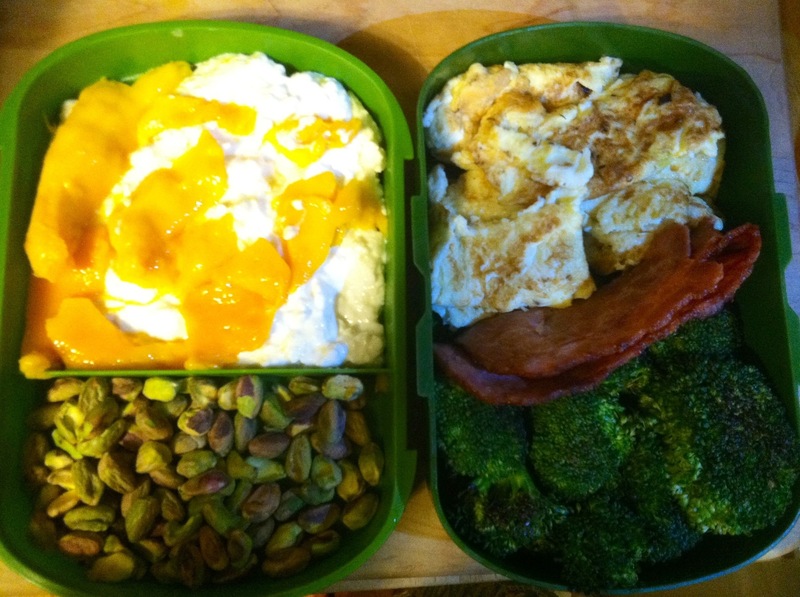 This one is a pretty simple breakfast bento. I got adventurous at about 3 in the morning before going to work and decided to try and make an egg white omelet. But somewhere in between the idea and the results, my elbow hit a cabinet and I cut the whole project in half. I then also realized that a smaller amount of eggs and egg whites might become a more successful omelet. So my eggs were large, tasty square pieces. When I was cooking what I thought would be an omelet, I sprayed the pan all over with coconut oil. While the finished product was not what I had hoped for, the eggs turned out to be incredibly buttery and flavorful. I think the coconut oil really helped in the flavoring. I highly recommend it to everyone! Beneath the eggs are some slices of turkey bacon and some sautéed broccoli (also with coconut oil). To the left is some cottage cheese, honey mango, and a handful of pistachios because I had run out of ideas and time to throw something else there!